In a five-day visit to Israel to meet with political,industry and academic leaders, NASA Administrator Charles Bolden pledged toboost Israeli participation in the U.S. space program, citing Earth science,robotics and instrumentation as potential areas for future cooperation. As a gesture toward closer ties, Bolden signed an agreementrecognizing the Israel Network for Lunar Science and Exploration as part ofNASA?s Lunar Science Institute. Future areas of scientific and industrialcooperation will be identified in a bilateral framework agreement to beconcluded later this year, Bolden said. ?We?ll exchange papers reflecting what we did and saw duringthe course of this visit ? and the agreement to follow will provide a frameworkfor moving forward,? said Bolden. The NASAchief and U.S. Air Force Gen. Kevin Chilton, commander of U.S. StrategicCommand, were visiting here as part of an annual space conference commemoratingIsraeli astronaut Ilan Ramon and fellow crew members who died in the February2003 Space Shuttle Columbia accident. The Jan. 27-28 event in Herzliya, Israel,organized by the Fisher Institute for Air & Space Strategic Studies,attracted some 1,200 people from nearly a dozen nations, and was co-sponsoredby the Israel Space Agency, and Israeli and U.S. firms. Speaking just days before the White House was set to unveilits newhuman spaceflight policy, Bolden said: ?Unless we change our minds ? and Idon?t think that?s going to happen ? we?re at the end of the space shuttle era.? We?re also approaching a time when we?ll have to answer, ?Do we really needastronauts in space??? 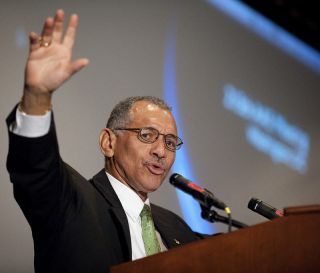 Bolden said U.S. President Barack Obama?s visionfor NASA will elevate the importance of international cooperation. ?Spaceexploration is an expensive, risky business that demands a tremendous diversityof skills and capabilities. The president wants me to work more with thepartners we have and to bring in more nontraditional partners like Israel.? Currently, about half of NASA?s 453 active internationalagreements are concentrated among 10 partner nations, half of which are inEurope. Israel, in contrast, has three ongoing agreements. ?You?ll see usvigorously engaged with Israel and other nontraditional partners as we moveforward with the new vision,? he said. The Israel Space Agency has proposed miniaturized spaceradar, laser communications, robotics and advanced sensors as areas forcooperation, only one of which ? robotics ? was singled out by Bolden in hisaddress. ?Robots should be precursors. They should be deployed as scouts,before we put humans at risk. ? There?s opportunity here for an Israelicontribution,? he said. In the security sphere, Chilton urged Israeli involvement inU.S.-led efforts to map, monitor and ultimately prevent damage to orbitingassets caused by space debris. ?The growing problem of space debris could makethis essential domain untenable for man or machine,? Chilton said. ?No onenation has the resources and the geography to do that today. U.S. telescopes,radars and sensors are not enough; we?ll need to improve situationalunderstanding. ?